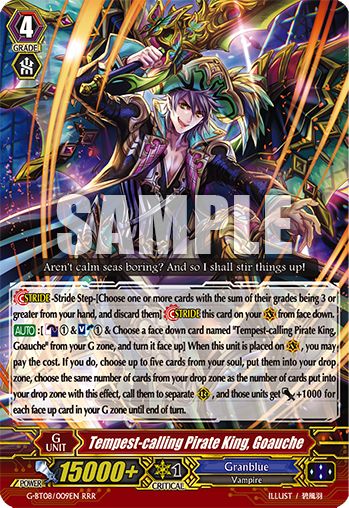 [AUTO]:[Counter-Blast 1 & Soul-Blast 1 & Choose a face down card named “Tempest-calling Pirate King, Goauche” from your G zone, and turn it face up] When this unit is placed on (VC), you may pay the cost. If you do, choose up to five cards from your soul, put them into your drop zone, choose the same number of cards from your drop zone as the number of cards put into your drop zone with this effect, call them to separate (RC), and those units get [Power] +1000 for each face up card in your G zone until end of turn. [CONT](RC)Shinken Hissatsu (This ability is active if you have three or more damage):This unit can attack from the back row. [AUTO](RC)[Generation Break 1](This ability is active if you have one or more face up G units in total on your (VC) or G zone):[Counter-Blast 1 & Soul-Blast 1] When this unit attacks a vanguard, you may pay the cost. If you do, this unit gets [Power] +9000 until end of that battle.